What exactly are smart cities? Some immediately think IoT, machine learning, and automation while others call to mind alternative waste treatments and non-traditional city layouts like the superblocks of Barcelona. With the urban population expected to reach 68% of the world’s population by 2050, it’s not surprising that tech giants, governments, and citizens are turning with renewed interest toward what it means to live and work in a modern city. But if the term “smart city” has become a somewhat sprawling concept, there are still a few emerging technologies which seem inextricably linked to the conversation. The following technologies are set to change the face of cities as we know them. The inclusion of several telecommunications companies in this list is noteworthy because it signals the importance of network technologies, specifically 5G, in the future of the smart city. Smart city optimists hope that the increased speeds of 5G will power the data collection necessary to realize efficiency gains in the provision of city services from IoT and Machine Learning as well as the smart homes that have been staples of forward-looking science fiction for decades. 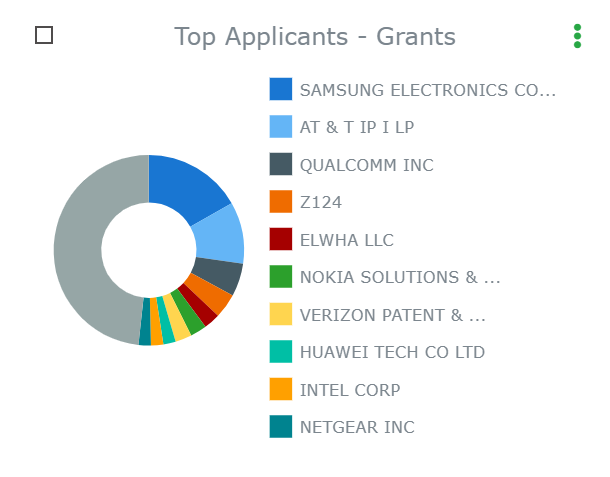 Running a search for US patents containing the words “5G” and “network” that don’t expire before 2025 in ktMINE’s Patent Search app and grouping by applicants yields Samsung Electronics CO LTD with 23 patents, AT&T IP ILP with 14, and Qualcomm INC with 8 as the top 3 applicants. Samsung has vowed to invest $22 billion in 5G and AI to secure a large share of the network equipment market; while on December 18th AT&T announced that they “will be the first and only company in the U.S. to offer a mobile 5G device over a commercial, standards-based mobile 5G network;” and Qualcomm has used their cellular communications standard essential patents strategically in the past. IoT holds a lot of potential for the smart cities of the future. For example, sensors have the ability to inform street lights when they should be on to save electricity or tell traffic lights that a bus is approaching so that they stay green for just a bit longer. Roads could gather information about foot traffic which might be harnessed to determine when to schedule road repairs and which streets should be heated in the winter. This same data might even be used for public safety. Self-driving cars may be able to take advantage of the interconnectivity of smart cities by receiving information about traffic conditions and automatically altering routes in order to minimize congestion and improve commute times. The technology has been progressing in leaps and bounds over the past five years. However, not everyone is happy about the trend. Residents in some of the towns where smart cars are being tested have not taken kindly to news stories about self-driving vehicle accidents and have even thrown rocks at the unlucky testers, and some experts now question whether an acceptable level of safety in self-driving cars is possible with current technology. A few are predicting an AI winter in which progress tapers and eventually stops completely until the next major breakthrough. Perhaps in response to these developments alternative methods of decreasing the number of drivers and reducing congestion have begun to crop up or increase in popularity. Electric scooters have received a bump in investment dollars. Solutions that tickle the sci-fi fancy include air taxis and flying cars. Some of the cost savings that could make flying cars a possibility are expected to come by removing pilots from the equation, however, a 2018 Deloitte prediction still places piloted flying cars as a reality between 2020 and 2022. Before these technologies can be fully integrated into the life of the modern urbanite, there are still some core tensions that need to be resolved as there is currently a roiling debate over the roles of government and big tech in the development of smart cities. One prominent story is that of Sidewalk Labs, Alphabet’s experiment in building a smart city from the ground up. Privacy concerns have caused headaches for the ambitious project whose Director of Privacy stepped down upon learning that the company did not plan to de-identify the data of Quayside residents at its source. Criticism has come from the outside as well. Activists like Bianca Wylie reject the idea the private enterprises should have this kind of power when it comes to urban planning. However, even given apparent drawbacks, it’s hard to imagine that the progression toward smart cities will stop completely. MarketsandMarkets has predicted that the smart cities market will grow to USD 717.2 billion by 2023, and despite growing concerns over data privacy, many are still willing to give their data away for free because of the obvious benefits. The concept of the smart city is probably here to stay.